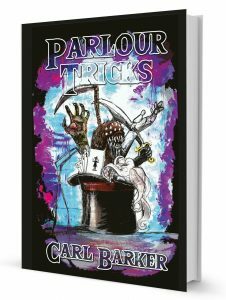 Ladies and gentlemen, drum-roll please, as the hardcover version of Parlour Tricks is now available to order from Amazon.co.uk / Amazon.com, priced at a very reasonable £20/$26. Stocks will be available shortly as we’re all just awaiting the first deliveries from the printers. The book will also be on sale directly from Parallel Universe‘s purchase page, as well as listed with Barnes & Noble and Wordery soon. I’ll add links for all of these as soon as they become available. Many thanks to both David Riley and Luke Spooner for all their hard word in making this happen, and to David especially for agreeing to publish the collection in the first place.